After witnessing the unconventionality, the disarray, and the absurdity that was the Republican National Convention, as displayed by its many hard-to-follow and unconventional speeches, I was ready for the Democrats to take the stage in Philly. As a political science student and a Wake the Voter, I wanted to see how a traditional convention should appear. After seeing how things can go wrong, I wanted to see how things can go well. The RNC seemed to have the same few themes, most of which were negative. There were the “Hillary is a crook” and “Obama has ruined our country,” themes. As Bill Maher put it, “all conventions are about tearing down the other side, to a degree,” but if we compare this convention to the standard degree of attacking the other side, “it’s a little off the chart.” There was also the theme of how horrible our country has become. In Trump’s view, it seems that to make America great again, we need to point out, and sometimes make up, all kinds of problems we are facing in our country, so we can then fix them; or as Trump emphasized, so he can fix them. In his emphasis on the problems in our country, his ability to singlehandedly fix our country, and his outspoken criticism of several minority groups in our country, Trump sounded not like a presidential candidate, but a fascist dictator. Finally, there were speakers who droned on and on trying to describe how great of a businessman Trump is. What Trump’s former business partners don’t seem to understand, nor do some of his voters, is that running a country is not the same as running a business. The DNC, on the other hand, was perhaps a completely opposite event. Whatever the RNC had emphasized, the DNC highlighted the opposite. While the RNC claimed Hillary was a crook, DNC speakers such as Bill and Chelsea Clinton emphasized the humanness of Hillary as a loving wife and mother. While the RNC highlighted Trump’s outsider status, DNC speakers, like President Obama, descried Hillary as an experienced leader in politics and a valuable cabinet member in the White House. Mr. Obama even noted that Hillary is the most qualified nominee for president in our nation’s history. Finally, Michelle went on to illustrate the beauty and success of the United States. 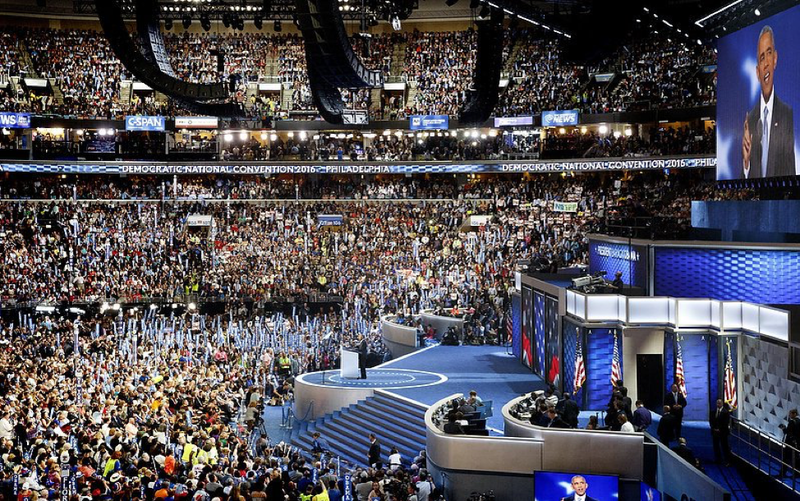 Where Trump had preached fear and hatred, the DNC boasted their values of love and acceptance. Where Trump had alienated countless Americans of countless identities and ideologies, Hillary and the Democrats celebrated them. Beyond Hillary and Michelle’s speeches, the DNC featured countless speakers of a variety of identities. There was a mother and daughter who had come to the United States from Mexico. There was a disabled woman, who noted how inappropriate Trump was to mock a disabled individual at his rally. Most memorable of all, there was the Khan family, who spoke about their identity as immigrants to America, members of the Muslim community, and the parents of a fallen soldier. Perhaps it makes it easier on the Democratic Party to have a convention after the Republicans do. Perhaps it makes it easier to have a convention after the Republicans nominate Donald Trump. Regardless despite their internal divide between Hillary and Bernie supporters, the Democrats appeared as a professional, experienced, and proud political party right after the Republicans demonstrated such an absurdly unorthodox convention.